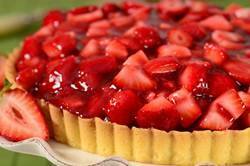 When strawberries are in season, you will definitely want to make this Strawberry Pie (Tart). It is delicious. Just imagine a buttery crisp shortbread crust, filled to bursting with fresh strawberries all coated with a glistening red raspberry jelly. And we are not using a packaged jelly, this is made with real raspberries, so its flavor is authentic not artificial. You can serve this Strawberry Pie plain or it is even better with a dollop of softly whipped cream. When I set out to make this Strawberry Pie, I wanted a pie crust that would complement both the flavor and texture of the fresh strawberries. I believe this Shortbread Crust fits that bill. It has a buttery flavor and a crisp texture, just like a shortbread cookie. It is easily made in your food processor and once the pastry starts to form clumps, it is ready to press into your lightly buttered tart pan. (Make sure the butter is cold and in small pieces so it blends easily into the flour. Also, the flavor of this crust comes from the butter, so try to use one of good quality.) The bottom of the pastry is pricked to prevent puffing up during baking. Place the crust in the freezer for about 15 minutes as this makes covering the crust with parchment paper and filling with weights unnecessary. Bake until golden brown, and then completely cool the crust before filling. If you would like to seal the cooled crust to prevent it from softening, brush the bottom and sides with either warmed apricot preserves or melted chocolate. Of course, this Strawberry Pie is all about strawberries, so we need to use great tasting ones. If you are lucky enough to live close to a u-pick strawberry farm or a farmer's market, that would be my first choice. However, in the summer you can also get good tasting strawberries at your local grocery stores. Choose strawberries that are bright red, fragrant, plump, and firm. The green leaf-like cap or hull should still be attached and not brown or wilted. Always check the underside of the container to make sure there are no squashed berries or red juice (sign of overripe berries). Strawberries are a delicate fruit and do not store well. If not using immediately store in a single layer on a paper towel-lined tray in the refrigerator up to 2-3 days. Do not wash or remove caps before storing. Now, the strawberries are covered in a gelatinized raspberry sauce. While you can use fresh raspberries, I prefer frozen unsweetened raspberries. They need to be completely thawed so they will easily release their juices. We also strain the berries to remove their seeds. Then the raspberry juice is sweetened with sugar and a little jam is added to help thicken the juice. This mixture is heated until it thickens. Then unflavored gelatin, that has been activated with water, is folded into the raspberry sauce. The sauce is placed in the refrigerator until it starts to gel (about an hour). The final step is to coat the strawberries with the delicious raspberry sauce, and place in the cooled pie shell. The Strawberry Pie needs to be refrigerated for a few hours until firm. This strawberry pie is best served the day it is made, but it can be covered and stored in the refrigerator for a few days. Shortbread Crust: Lightly butter, or spray with a vegetable spray, an 8 or 9 inch (20-23 cm) tart pan with a removable bottom. Place the tart pan on a larger baking sheet and bake the crust until golden brown, about 13 - 15 minutes. Remove from oven and place on a wire rack to cool while you make the filling. Filling: Thaw the frozen unsweetened raspberries and then transfer to a fine mesh strainer placed over a large bowl. Gently press the berries with the back of a large spoon to release their juices. (All that should remain in the strainer is the raspberry seeds.) Put the raspberry juice, along with the sugar and jam, in a medium sized saucepan over medium heat. Stir until the jam dissolves and the sauce just comes to a boil. Reduce heat and simmer for about 10 minutes, stirring occasionally. Meanwhile, in a small measuring cup sprinkle the unflavored gelatin over 1/4 cup (60 ml) of cold water. Let this mixture sit for about 5 -10 minutes, or until it becomes softened and spongy, and then microwave about 20 seconds or until the gelatin has completely dissolved. Remove the raspberry juice from the heat and stir in the dissolved gelatin and lemon juice. Transfer to a bowl and refrigerate until the mixture starts to gel, stirring periodically (this takes about an hour). Meanwhile, cut the strawberries into bite-sized chunks. Place the strawberries in a large bowl and fold in the thickened raspberry juice, making sure all the strawberries are coated with the sauce. Pour the strawberries into the baked and cooled pie shell and place in the refrigerator until firm (about three hours). Serve with softly whipped cream, if desired. Cover and refrigerate any leftovers. This pie can be stored in the refrigerator for a couple of days. Serves 8. Preparation time 1 1/4 hours.